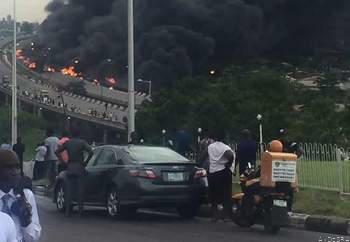 At least nine persons have been confirmed dead in a tanker explosion that occurred on Otedola Bridge outward Lagos on Thursday evening. Four other persons were also confirmed injured. Confirming the number of the casualties, the Federal Road Safety Corps spokesperson, Mr. Bisi Kazeem, added that 54 vehicles were also burnt in the incident. The affected vehicles comprised the fuel tanker, five buses, two trucks, one tricycle, and 45 cars. Our correspondent noted that no less than eight body bags were lined up on the bridge (see main photo), as rescue operations continued. While Kazeem said that rescue operations were ongoing, eyewitness’ account related that the incident resulted in a traffic jam that extended to the Third Mainland Bridge.